Having increased its winning streak to 27 games Monday night, the Miami Heat is now within reasonable striking distance of the NBA record 33-game winning streak of the 1971-72 Los Angeles Lakers. The Heat has had to come back from some pretty big second-half deficits, such as 27 points to Cleveland midway through the third quarter and 13 points to Boston with 8:26 left in the fourth. Nothing has come easy for Miami. Even the lowly Charlotte Bobcats, owners of the NBA's worst record (currently 16-54, .229) jumped out to a 19-8 lead over the Heat last Sunday, before Miami came back and took control. In a previous posting, I noted that, in contrast to this year's Heat, the 1971-72 Lakers rarely seemed to have trouble during their 33-game streak. However, that conclusion was based only on final margins of victory, without taking into account the possibility that the Lakers struggled early in games and only pulled away toward the end. I have now gone back and looked at the Lakers' 1971-72 game-by-game log, to get more detail on each of the team's games during the streak. 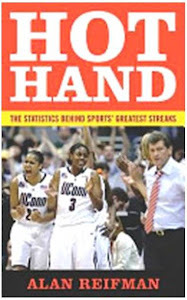 Specifically, I checked the quarter-by-quarter line score, which is part of the box score for each game. To take an example, in the Lakers' December 3, 1971 game at Philadelphia, which was L.A.'s 16th win during the streak, the line score of points per quarter read as follows (I added the cumulative score at the end of each period in parentheses). 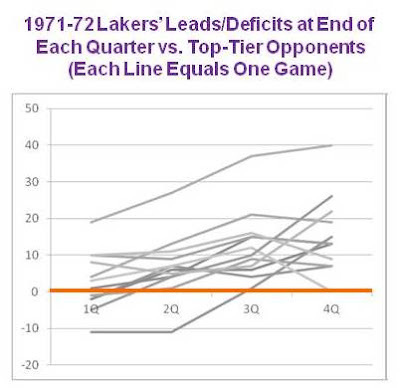 As the first graph shows, in games during the streak against top opponents, the Lakers tended to hold modest leads after the first quarter, which they gradually expanded over the course of the game. The bottom curve represents the above-described Philly game, in which L.A. trailed by 11 points after the first and second quarters, led by 1 after three quarters, and won by 15. 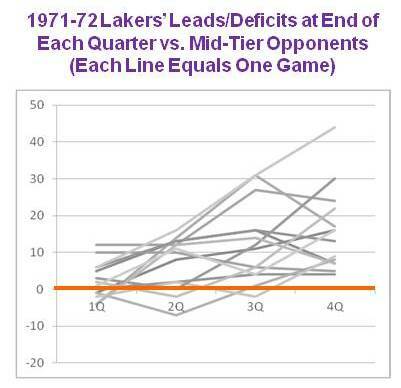 The one game touching the break-even point (red line) after four quarters was a December 10, 1971 overtime win over Phoenix, the Lakers' 20th win during the streak. In that game, the Lakers failed to hold a 12-point lead over the Suns after three quarters. The box score shows Wilt Chamberlain going 0-for-6 from the free-throw line overall; if some of those attempts took place in the fourth quarter, that could explain Phoenix's comeback. Against mid-tier opponents, the Lakers did have some first-half difficulties, but usually led after three quarters. Finally, against bottom-tier/recent-expansion opponents, the Lakers generally did not win by blow-out. The Buffalo Braves (now the L.A. Clippers), in particular, gave the Lakers trouble in the first and second quarters. 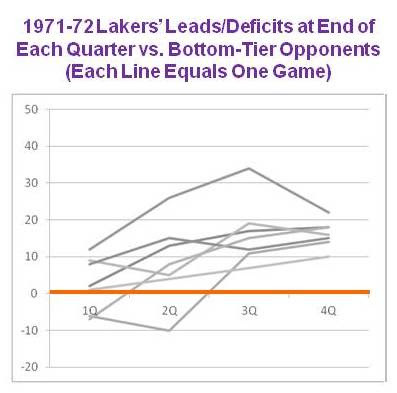 The 1971-72 Lakers thus were similar to this year's Miami Heat in sometimes facing early deficits against weak competition. Why is margin of victory important? In addition to the coronary health of Heat fans, margin of victory affects the team's ability to give LeBron James and other top players some rest time. As I showed in a previous posting, it appears that "James gets three and one-half extra minutes of rest when the Heat is winning handily."